Commissioners from Clackamas, Multnomah, Hood River counties name replacement for Rep. Mark Johnson. With an unanimous vote from the commissioners of Clackamas, Multnomah and Hood River counties, Hood River resident Jeff Helfrich is the new House District 52 representative. 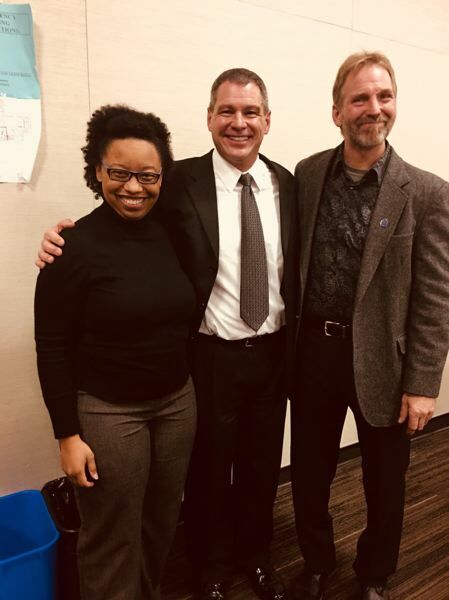 "I am very humbled by this process and to be selected to represent District 52," Helfrich told The Post following the announcement. A group of 14 commissioners met — some in-person and others via conference call — at 4 p.m. Wednesday, Nov. 29, to hear interviews from the candidates and appoint a replacement for former Rep. Mark Johnson, also of Hood River. Johnson recently announced his resignation to become executive director for OBI, a lobbying group of Oregon Business Association and Associated Oregon Industries groups, which focus on job creation and stimulating Oregon's economy. Up for the appointment to replace the four-term representative were Stan Pulliam of Sandy, Erick Haynie of Hood River and Helfrich. Several members of House Districts 52's constituency came out to voice their preference for either Pulliam or Helfrich. Rhododendron resident Rick Applegate didn't speak for any candidate, but voiced a concern that he should represent the Mount Hood precinct, which he felt has been an "outlier" in the district. "Mark Johnson was an exceptional legislator for our community, and it was shown, if you look at the numbers from all the election cycles, how important he was to our community," Applegate said. "We're a rural community. We need legislators that represent everybody in that community — people that are willing to communicate with out community through the media. … We need to really work hard to bring our communities together, not divide them … You can leave our community intact and feeling like we're not an outlier by electing somebody who's experienced working with government and who can work for Democrats, Republicans, (everyone)." The commissioners asked six questions of each of the candidates. Topics ranged from health care to immigration to transportation. In the end, it was Helfrich's "frontline experience" from more than 25 years in law enforcement that gained the most respect from the commissioners. Many made note of his response when asked if he supported the Oregon state law that prohibits state or local funds being spent to aid federal immigration enforcement. "That is a question (answered by) the ORS," Helfrich answered. "It is prohibited to (do so). I would continue that." Clackamas County Commissioners Paul Savas and Ken Humberston admitted they came to the meeting hoping to vote for a Clackamas County resident to represent the district, but both ultimately voted for Helfrich. "Well I came here, quite frankly, hoping to be able to vote for a Clackamas County resident," Clackamas County Commissioner Ken Humberston said. "But, if I'm being honest and really evaluating resumes, preparation and experience, one candidate stood out above all the other candidates in my mind. He had the broadest base of local government experience, which I think bodes well for us in Clackamas County, knowing that we'll have somebody in the Legislature that understands local government. His background in law enforcement resonates with me, obviously. (Helfrich) was the most prepared and had the most direct answers." Though disappointed he won't be representing House District 52 himself, Helfrich's fellow Hood River candidate Haynie was concilatory. "I fully support Jeff," Haynie said. "I think he did a great job and I wish him the best. I think Jeff will represent the district well." Pulliam told The Post, "I'm obviously disappointed, but I've come away with it so humbled by the support I've had. I've learned so much about the communities of District 52 … I look forward to what comes next." Pulliam said he will consider a run for the seat in next year's election. A longtime public servant, Helfrich served on the Cascade Locks Planning Commission and City Council, the Mid-Columbia Economic Development District Board, in the Air Force during the Gulf War and as a Portland police sergeant. "I understand the needs of my community well as both leader and member," he said in a letter earlier this week. "Upon appointment to Representative for House District 52, I will continue and expand upon the work of (former) Rep. Mark Johnson to improve economic growth, transportation and other infrastructure planning and development that support it; education and workforce development; environmental stewardship and emergency preparedness; and health and human services."